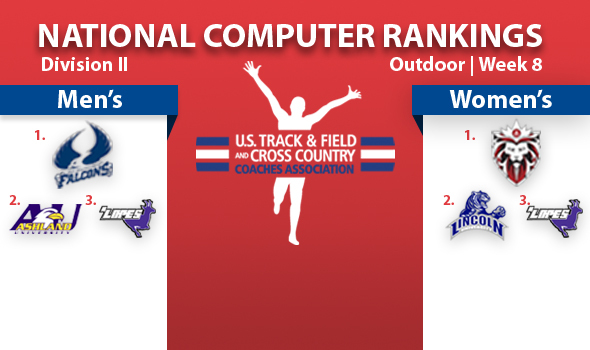 NEW ORLEANS – For the third week in a row both the men’s and women’s U.S. Track & Field and Cross Country Coaches Association (USTFCCCA) Division II National Team Computer Rankings feature two new No. 1 teams in indoor champions Saint Augustine’s men and Academy of Art women, who are poised to sweep the 2013 NCAA track & field titles. Completing the sweep this week at the Division II Outdoor Championships at CSU Pueblo, May 23-25, will not be an easy task for either team, as both lead their respective No. 2 teams by fewer than two points in the rankings. Saint Augustine’s has a very narrow lead over No. 2 Grand Canyon, with No. 3 Ashland lurking just behind. The women’s competition is perhaps even tighter, with the computers projecting three teams with nearly identical chances of taking the title in No. 1 Academy of Art, No. 2 Lincoln (Mo.) and No. 3 Grand Canyon — with defending champion Grand Valley State right on their tails. The National Team Computer Rankings are a projection of how teams could fare at the NCAA Outdoor Championships. An explanation of the rankings system can be found here. Unlike in the Division I rankings, the Saint Augustine’s men can claim the No. 1 ranking and the highest number of qualifiers with 23, giving them a narrow lead over No. 2 Grand Canyon in the computer projections. Saint Augustine’s checked in with a team score of 221.83, just slightly ahead of Grand Canyon at 220.28, and not too far clear of No. 3 Ashland at 209.60 and No. 4 defending champion Adams State at 189.26. Saint Augustine’s strength is based largely on its stable of sprinters and hurdlers, with 16 of its 23 qualifiers — more than all but three other teams’ full totals — coming in those events, including eight top-10 entries and division-leaders Moussa Dembele and Elhadji Mbow in the 110 and 400 hurdles, respectively. No. 3 Ashland is the only other team with 20 or more qualifiers, checking in exactly at 20. The Eagles will send 14 top-10 ranked student-athletes to Pueblo, including No. 1 Drew Windle leading three top-six 800 runners and top-ranked hammer thrower Garrett Grey. Windle leads the biggest middle-distance contingency in the country with four qualifiers. No. 2 Grand Canyon and No. 10 Grand Valley State each qualified 17 student-athletes to the championships. Grand Canyon’s six jumpers are the most of any team at the championships, featuring No. 1 Aaron Hill and No. 3 Kevin Lashley in the long jump, and No. 2 Vince Frawley in the pole vault. The sprints are also strong for the Antelopes with division-leading Dario Horvat at 100 meters and Fred Taylor at No. 2 at 200 meters and No. 3 at 100 meters. Adams State will send 14 to the championships, including the division’s largest group of middle and long distance runners with eight total. None of the seven are ranked below No. 7 in their respective events, with Matt Daniels ranked No. 1 at 5000 meters and No. 3 at 1500. Tabor Stevens (No. 3 Steeple/5000) and David Sanchez (No. 2 5000/No. 6 10,000) are also top-six in multiple events. Findlay completed the top five with 12 qualifiers and a team score of 131.42. The indoor champion Academy of Art women are in position to sweep the Division II track & field team titles in their first year as an NCAA program, but doing so will mean overcoming a trio of tough competitors who are nearly equally favored by the computers to claim the title. Academy of Art is No. 1 with a team score of 236.27, while No. 2 Lincoln (Mo.) is fewer than two- points back at 234.84 and Grand Canyon is just beyond two points behind at 234.15. All while defending outdoor champ Grand Valley State sits at No. 4 with a score of 208.32. The Urban Knights of the Academy of Arts trail all three teams in terms of qualifiers to the NCAA Division II Championships, but that was also the case when the squad claimed the final indoor rankings before taking home the DII team crown. Standout Vashti Thomas will again be a significant factor in their run for a title, as she is ranked No. 1 at 200 meters and in the 100 hurdles and the long jump, and is No. 3 in the triple jump. She leads a crew of 100 hurdles that features five of the division’s 11 best. Lincoln enters the championships with the largest number of qualifiers with 24 total, including a division-best 14 in the sprints and hurdles. The Blue Tigers will send 10 top-12 ranked sprinters and hurdlers, including two of the top three in the 400 hurdles in No. 2 Yanique Haye and No. 3 Michelle Cumberbatch, the defending NCAA champ. The Lakers of Grand Valley State sit right behind Lincoln with 23 entries into the championships, buoyed by seven distance runners and seven throwers. Chief among the Lakers qualifiers is Sam Lockhart, who is ranked No. 1 in the division in both the discus and shot put, and No. 3 in the hammer. Hannah Osborn (No. 4 steeple, No. 10 5000) leads six middle distance and distance runners in the top 15 of their events. No. 3 Grand Canyon will send the largest jumps group with six competitors, and the third-largest sprints/hurdles group with nine — both of which are mostly composed of top-10 talent. Shavine Hodges is the No. 2 seed at both 100 and 200 meters to lead a sprints corps in which all seven sprinters are ranked within the top 10 of their events. The same is true of the jumps, where none of the six student-athletes are ranked lower than ninth in the nation with two each in the pole vault, long jump and triple jump. Adams State rounded out the top five with 14 qualifiers and a 141.06 score in the rankings.